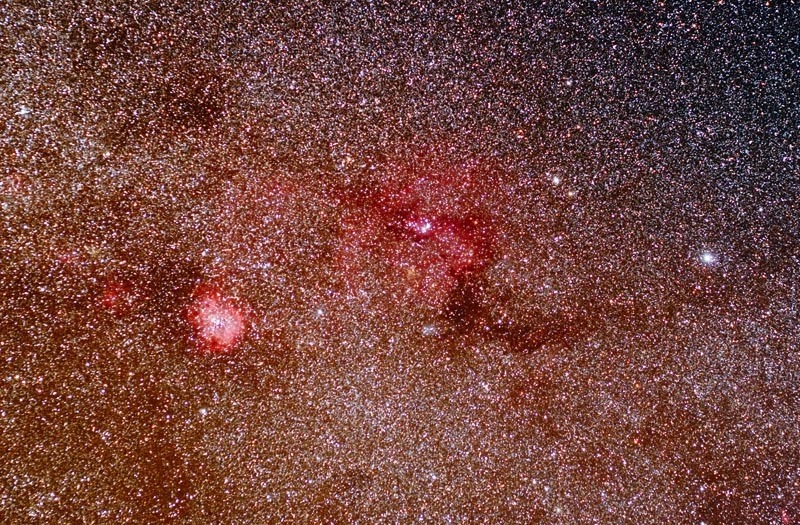 This image features a section of the winter milky way, and goes from Orion on the left/lower to part of Auriga on the lower right. It has ~130,000 stars per Registar. It's an imperfect but serviceable mosaic/combination of this image Orion: Wide-field Nebulosity Galore (2007), along with a separate picture of the area close to Auriga. Scroll down and check out the links to specific objects of interest. Below: A more artistic version; no labels. 3/15/2007 from the Davis Mountains, TX, USA. Canon EOS 20Da (unmodified), with Nikon 28mm f2.8 AIS lens operating at f4, Losmandy G-11 mount. My current image processing workflow is here. The Rosette Nebula is the bright circle on the left, while in the middle the red glow from the Christmas Tree Cluster area dominates. Sharpless 280 (SH-280) is the smaller red area to the left of the Rosette. Alhena, gamma Gemini, is the bright star on the right. This is a 6 hr. total exposure through a the Nikon 55mm camera lens at f4. Conditions were hazy at times so this is a little soft. December 2010 from the Davis Mountains. Below: Close-ups of some winter milky way objects.